The CopyBox 5 "PC-Connected" duplicator is an exceptional version of the regular CopyBox 5 CD/DVD duplicator. The unit has one CD/DVD reader and five CD/DVD writers, also included is an internal hard drive and an USB PC connection. PC connection is used to transfer files from PC to hard drive. CD/DVD images can be stored on the internal hard drive. Once copied to the hard drive, "master" discs are no longer required for duplication. The main advantage when duplicating from the internal hard drive is the maximum stability and reliability; read errors are eliminated. The CopyBox "M-DISC Ready" writers are able to duplicate M-DISC recordable DVD's. These special archiving DVD's preserve your valuable data up to 1000 years. The CopyBox USB PC connection allows the internal hard drive to be accessed directly from a PC using the included "Image Manager" software. ISO (CD or DVD) image files created on a PC can be transferred directly to the CopyBox hard drive. This makes the burning of master discs no longer necessary. The CopyBox 5 can make five DVD duplicates at once at max 24x speed. (CD max 48x speed) This operation is completely stand-alone and does not require any software or PC, the CopyBox 5 Standard is ideal for fast and easy duplication of any common recordable CD or DVD. The fast writers can duplicate a DVD in 5:15 minutes (CD 2:40). This results in a production capacity of 52,9 DVD's or 97,3 CD's per hour. The CopyBox 5 functions are selected using the LCD display and control buttons on the front of the unit. - USB PC connection for transferring image files to internal hard drive. - Internal hard drive for storing CD/DVD image files. 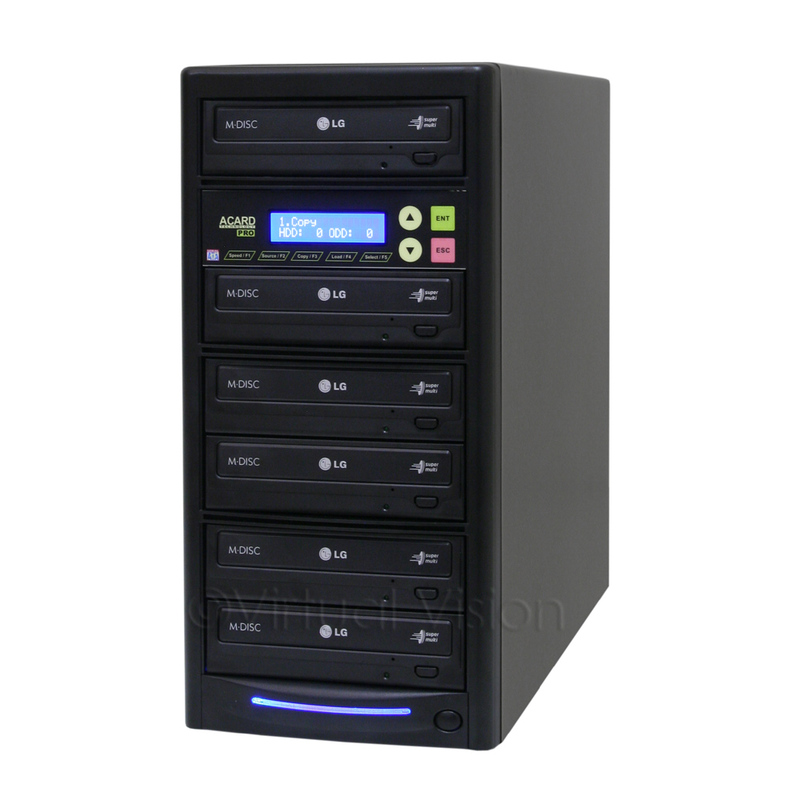 - One CD/DVD reader, five CD/DVD writers. - Suitable for most users, basic computer knowledge required.